If you have ever read any of my blog posts, you will know that I am a huge fan of Vitamin C. HUGE. Vitamin C is one of those skincare ingredients that actually works. It helps in so many ways: it is an anti-oxidant that lightens hyperpigmentation, it evens out skin texture, it softens skin, helps reduce lines and wrinkles, lightens acne scars and prevents future aging. What else do you know of that can say it does that? MyChelle has a Vitamin C serum at 17% that is pretty powerful and is very good. Recently however, they released a serum that is much stronger. MyChelle recently released an L-ascorbic acid serum at a 25% strength. This product is called MyChelle Perfect C PRO Serum 25%. It is a professional strength serum. Usually only professionals like myself use or dispense this strength of serum. The professional strength serum of Vitamin C does the following: it brightens the complexion and provides powerful antioxidant/antipollution/anti-aging benefits. Formulated with the highest active level of stable 25% L-ascorbic acid to address the improvement of skin texture and visible signs of aging. In this bottle is a wonderful anti-aging powerhouse. In addition, also included are Plant C-Stem™ and Ubiquinone (CoQ10 enzyme) to help protect stressed skin for a much more luminous complexion. This serum is recommended to help renew and revitalize mature or damaged skin, or for those who are have already been using a Vitamin C regimen. I cannot stress enough how well Vitamin C works for the skin. To me, it along with Retinol, are the two best anti-aging ingredients we have at our disposal to really keep skin looking young and beautiful. The use of a high percentage Vitamin C, a good Retinol and a broad spectrum sunscreen of at least 30 will help keep skin in tip-top shape. The best way to use this serum is to apply one pump to damp skin in the morning after cleansing. If you are layering serums, use Perfect C PRO Serum 25% first or follow with your favorite moisturizer. Shake well before applying. Make sure to use a sunscreen. The product color will darken over time, as is natural with Vitamin C products. I found that this was a fabulous serum. I happen to be a connoisseur of Vitamin C serums and of all the ones I have tried, this is the best one yet. It is non irritating to the skin, which makes it even better. I like that it brightens up the complexion pretty fast, so hyperpigmentation goes away quickly. It helps with fine lines and wrinkles (so I have heard, I don't have any yet), and it evens out skin texture and softens the skin. This I can say from experience is true. My skin has never been softer and the texture of my skin is like silk. This serum is for normal skin, dry skin and could even be used for combination and oily skins. Frankly, any skin type could use this, even acneic skin. It will actually lighten up acne scars too, that is one of its other big effects. I would recommend this for any skin type. This serum is great for anyone who is interested in anti-aging skincare or if that person has severe acne scarring. It is a great serum and I highly recommend this to just about anyone. After being named one of 72 finalists from more than 720 entries, MyChelle Dermaceuticals emerged as one of only 21 winners of the New Hope Network 2017 Expo West NEXTY Awards. Perfect C™ PRO Serum was presented with the award for "Best New Beauty Product" on March 11, 2017 at Natural Products Expo West in Anaheim, CA. The semi-annual NEXTY Awards shine a spotlight on innovative products that inspire and uphold the integrity of the natural product industry. 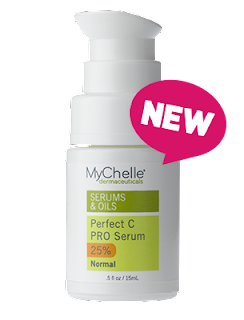 MyChelle Perfect C PRO Serum 25% is available from www.mychelle.com. Like MyChelle on Facebook: https://www.facebook.com/MyChelleDermaceuticals; Follow MyChelle on Twitter: @mychelle; Follow MyChelle on Pinterest: https://www.pinterest.com/mychellebeauty/; Follow MyChelle on Instagram: https://www.instagram.com/mychellebeauty/ and Subscribe to MyChelle on YouTube: https://www.youtube.com/user/MyChelleSkinCare.